In April 2000 we presented a Gallery of nineteenth century business firm letterheads. 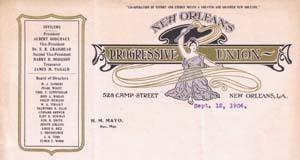 Those letterheads were selected from our Rare Vertical File, but many more examples of letterhead art exist in the correspondence files present in various record series throughout the City Archives and other Louisiana Division Special Collections. This month we feature fourteen examples from the records of Mayor Martin Behrman's administrations, 1904-1920 (Behrman also served as mayor from 1925 until his death in 1926). 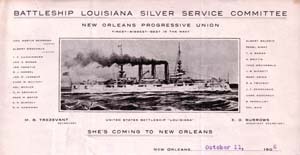 This time, though, when you click on a letterhead thumbnail you will be able to view the entire letter along with some words of explanation.